Saturday morning, we received about 7/10ths of rain. This will help some areas, but hurt others. Areas with standing water for prolonged periods may not fair well. Luckily, it is forecasted to be a cool day topping out at around 80. Last night was also a cool 65 degrees which lowered soil temperature significantly. It is not a coincidence that the areas with puddles are the areas that died in the first place. These areas "cooked" in mid-July when the surface water and high temperatures lead to the death of Poa annua. For more on this phenomenon, see "Turf Notes: Summer Decline of Annual Bluegrass". Overall, we are happy to see some germination on this fairway. I would expect to see some of the tees start germinating in the order that we seeded them last week. I'm guessing we may see some action on #4 and #2 tee by Sunday or Monday. We are looking at some 90 degree days next week so some mid-day watering will need to be performed. The trick now is keeping the seedlings alive! Before the flood, I wrote about the problems with annual bluegrass, or Poa annua, that golf courses have been experiencing this summer. We started work on this problem today. Our first step is to slit seed the tees and fairways with bentgrass. Some areas, like the par-3 approaches, already have a significant Penncross population so we will focus on the areas that do not. With a lot of care and some luck, we should be able to get some good germination in less than a week. Seeding in the summer can be difficult, but since the annual bluegrass is weak at this time we should be able to "get the jump on it" with bentgrass. If we waited for cooler temperatures, the annual bluegrass would germinate and outcompete our new bentgrass seed. The drawback to seeding bentgrass in the summer is the likelihood of "damping off" which we will have to watch for. One of the advantages of slit seeding is the minimal disruption to play it causes. 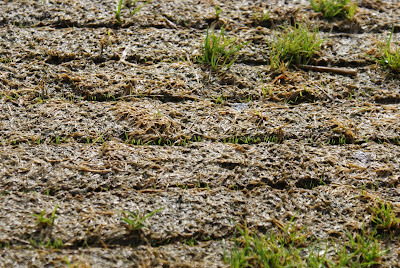 Many areas can be slit seeded without any obvious effect. Areas with patches of declined annual bluegrass will show the slits for a while before they close up or germination occurs. Some areas we will have to do more than slit seed, but a slit seeding program will help most of our problem areas greatly. I will update when germination occurs! The ground is drying out fast after the flood last weekend. We were lucky the water went down fairly quickly. The maintenance crew has now fixed all the sand traps and mowed almost all the rough. The course is starting to look like normal. Don't worry. They have been removed! On Friday night and Saturday morning, our area was hit by heavy storms and flooding . . . again. With some trouble due to closed roads, the maintenance crew arrived at the course to find our 5" rain gauge already full at 5am. In all, we had around 7" of rain overnight. According to a neighbor, the water almost reached 1987 levels. Storm Total Map from National Weather Service shows Villa Park from 6-8"
As of this post, the water has left the course except for a some puddles. Much of the debris has been picked up. The evidence of the flood is still apparent in the fine layer of silt on the turf in some areas and the serious damage to the sand traps. We expect to be open on Monday. 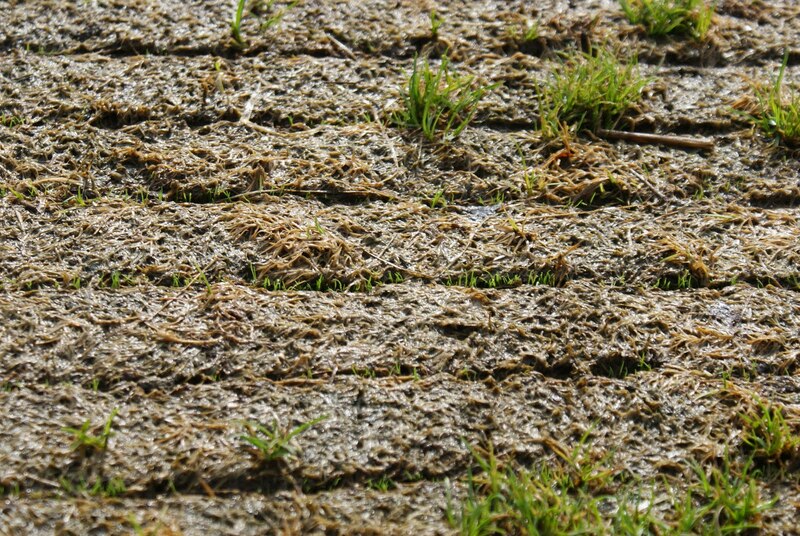 Most turf is composed of different species of grass, unless it is a new construction planted as a monoculture. In most older golf course fairways, you can observe different types of bentgrass, Kentucky bluegrass, rye, Poa annua, and Poa trivialis all within a 500 square foot plot of turf. This has some benefits. Often when one species declines, another will take over. It is the transition period that causes problems for turf managers. 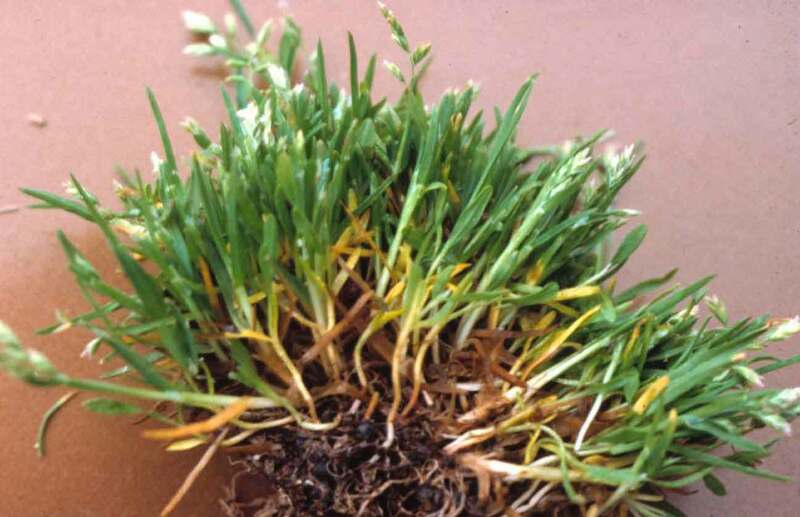 Of the above listed species Poa annua (annual bluegrass) is the most problematic. 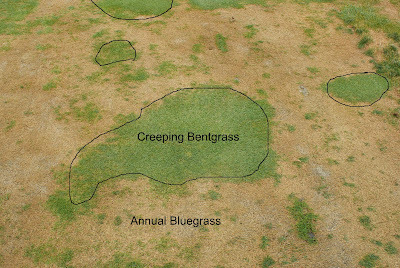 The life cycle of annual bluegrass is important to understanding its summer decline. Annual bluegrass grows aggressively in spring and germinates aggressively in fall. Summer and winter are its weak points. It does not survive cold temperatures or ice cover like perennial species, and it is genetically programmed to die during the summer. Some years, like 2009, it survived all year under cultivation (like at a golf course). This year, its weaknesses are more clear. 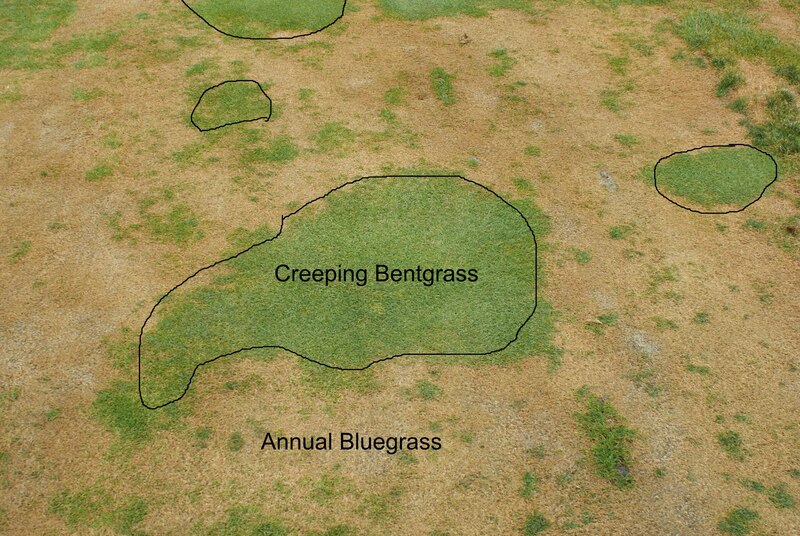 Unlike creeping bentgrass or Kentucky bluegrass, annual bluegrass does not have a physiological mechanism like dormancy for dealing with heat stress. It doesn't have to since it relies on seed to perpetuate the species. 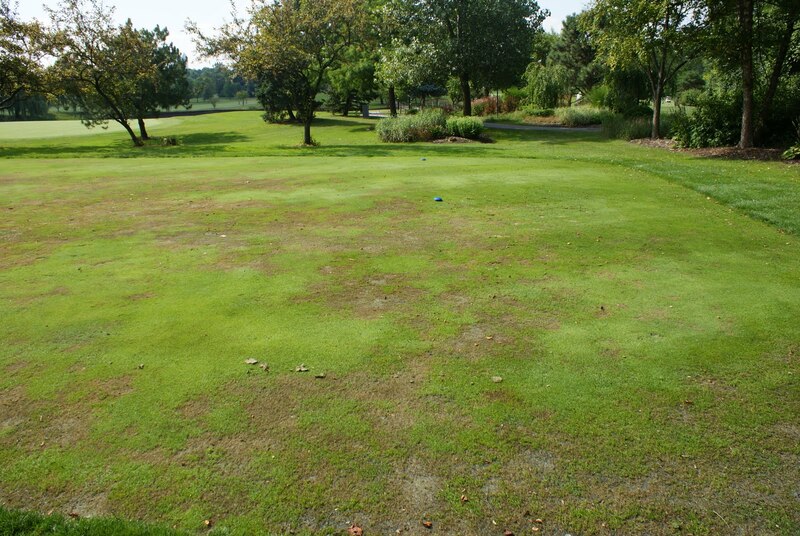 Turf managers often look at soil tempurature to determine the likelihood of turf stress. Significant root growth stops at 70 degrees F in cool season grasses, and completely shuts down at 80 degrees. Turf is in serious trouble at 90, especially annual bluegrass. Our soil tempuratures at the 4" level have been reaching 84 degrees with surface temperatures over 100 degrees some days. In the presence of water, this leads to scald or wet wilt. According to Dr. Beard, a well-known turf expert, "cool-season grasses - such as bentgrasses (Agrostis spp.) and annual bluegrass (Poa annua) - are physiologically adapted to optimum growth at temperatures of 60 to 75 degrees F. Even so, cool-season grass species demonstrate various capacities for heat resistance, ranging from medium for grasses such as Kentucky bluegrass to very poor for annual bluegrass and rough bluegrass, among others." See his article "Dealing with heat stress on golf course turf" for a great discussion of summer decline. A lot of factors contribute to the growth of annual bluegrass in fairways. Low mowing heights allow annual bluegrass to invade other types of grass, along with irrigation, fertilization, and low areas with poor drainage. A 2.5 inch bluegrass lawn is in little danger of being invaded, but it is inevitable on a 1/2 inch fairway. In a classic turfgrass catch-22, a lot of golf course maintenance practices like mowing, fertilization, and irrigation even when done right allow annual bluegrass to survive making the situation worse, not better. At Sugar Creek and many area golf courses of similar construction, a lot of Poa annua declined over the last two weeks. We had an abnormally wet June followed by a dry period. Often turfgrass benefits from rainfall, but not in excess. The prolonged wet, warm period encouraged shallow rooting in many low-lying areas. During the period from July 6th to the 13th, it rained here every day but one including a soaking 1" rainfall on the 11th. The turf did not have a chance to dry out before we had 5 days of 90 degree temperatures from July 14th to 18th. Solar radiation plus excessive moisture plus high soil temperatures = "physiological decline of Poa annua." Another fancy term for it is "necrosis due to abiotic environmental factors." Many superintendents like myself prefer a simpler term: "It baked." The Poa baked on certain tees and fairways in areas with saturated soil. The spike in soil temperature literally cooks the cells of the plant. Often when we see brown grass, our first instinct is to put water on it. That is why you may see superintendents using soil probes to determine if the stress is caused by too little water or too much. More often than not, the cause is too much water. While these areas of Poa annua are suffering right now, they will come back from their own seed once soil temperatures go down and the days shorten. That is what they are genetically programmed to do. Looking back at photos from 2005, another rough year for turf, the same areas suffered during the summer but came back quickly in September. Through the following pictures, I'll try to give my diagnosis and answer that important question: "Why did that grass die?" Back tee on the 4th hole: This tee is somewhat shaded with inadequate drainage. It is, or was, mostly comprised of Poa trivialis (Roughstalk bluegrass) and Poa annua (annual bluegrass). The green turf is the Roughstalk bluegrass which is only slightly more heat tolerant than annual bluegrass. I watched the Poa annua on this tee decline over the course of 1 day on July 14th. There were no signs of disease or other causes and the surface moisture under the turf canopy was hot to the touch. Diagnosis: Scald of Poa annua. From "Understanding Wet Wilt" by Dr. Peter H. Dernoeden: "On sunny days when air temperatures exceed 90°F, the temperature in the upper 2.0 inches of wet soil can range from 95°F to 100°F. These conditions led to root dysfunction and/or a rapid loss of roots." And later: "Indeed, turf almost literally 'cooks' in hot and wet soils. Affected greens initially appeared brownish and water-soaked. Turf soon thinned out in irregular shapes, but damage often followed the natural drainage pattern of the green." The 5th tee was sodded in 2003 with a low-mow cultivar of bluegrass. Unfortunately, the soil settled and created a drainage problem. With low mowing heights and excess water, Poa annua took over this tee. Over the years, we aerified, topdressed, and seeded frequently to try to improve the situation, but to no avail. You can see some algae growth on the scalded Poa annua which died in the presence of water on the same days as the 4th tee -- July 14th through the 18th. It is difficult to tell from the photo, but the soil was still moist even after several days of drying. You can see the layer of top dressing to the left of the photo. Even with this layer, areas of the tee are still lower than the rest causing water to sit there for long periods. Diagnosis: Scald of Poa annua. Again. This area is often soaked after rains. There is only about a foot of elevation difference between here and the creek and the contour is not consistent. There are ridges that hold the water here for extended periods. The interesting part of this photo is not the what went wrong but what didn't go wrong. Why did some patches survive and others did not? They had the same soil conditions, moisture levels, fertility and maintenance. What is different about them? The answer is genetics. This isolated patch of creeping bent clearly illustrates the difference between the two grasses. Even though this patch is not an intentionally seeded cultivar - it simply drifted here on its own - it was able to take what nature threw at it while the annual bluegrass could not. Due to the grading of the fairway, this will always be tough spot to grow grass, but this photo indicates to me that bentgrass would be a better species for the area than Poa annua. While it is difficult to establish turf during the summer months, slit seeding some bentgrass just might increase the percentage of quality turf in the area. Once fall hits, the annual bluegrass will germinate with a vengeance and fill in the remaining area. It's a never ending battle. Recent turf reports from the Chicago District Golf Association address this issue: See July 16 - From this report: "Even if we do everything correctly, Mother Nature may not play fair. I am sure we will have issues, but to what extent it is hard to say. 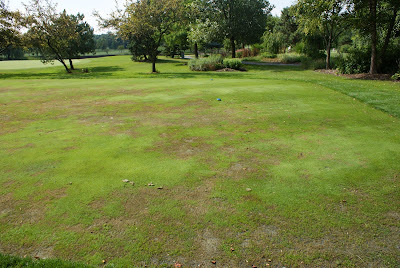 Clearly Poa annua, which does not like hot weather, will die." WARM (Water and Atmospheric Resources Monitoring Program) - This site tracks soil temperature and evapotranspiration in Illinois. I use it all time as a resource before going out and taking local readings. Search the USGA Green Section Record for "annual bluegrass" to find everything you would ever want to know about Poa. 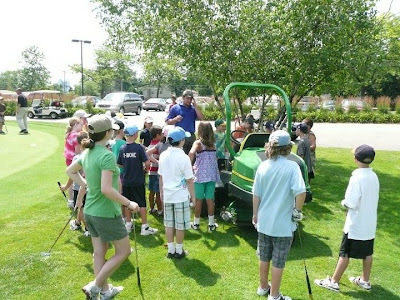 Thanks to the efforts of our golf pros and staff, we have a very popular Junior League at Sugar Creek. 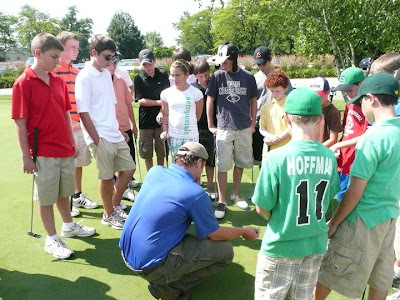 Juniors are introduced to everything from putting technique to course etiquette. 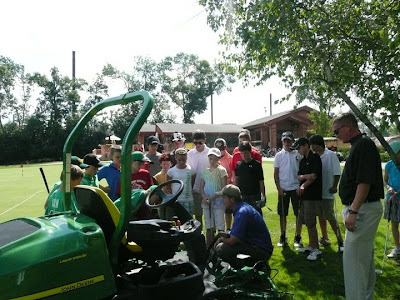 This year, we added a new element to the program involving the superintendent and course maintenance. 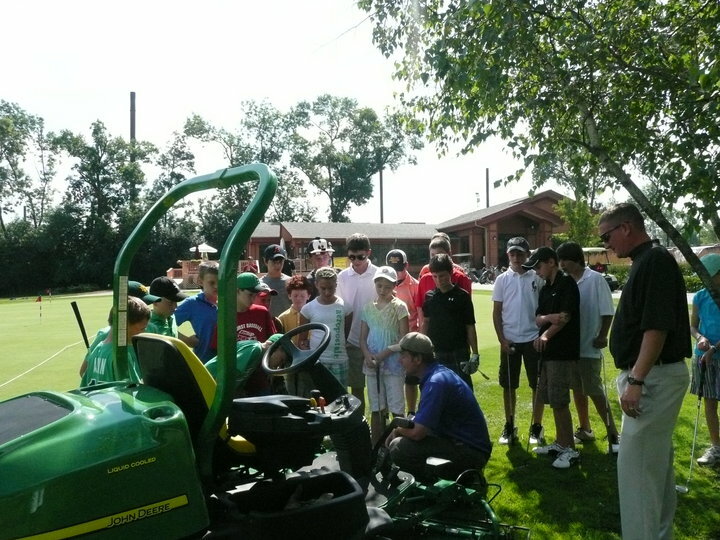 During a 15 minute talk, I had an opportunity to explain the basics of course maintenance, show the junior golfers the greens mower, demonstrate how to fix a ball mark, and answer questions. I think it was as fun for them as it was for me. It's never too early to start educating golfers about what they can do to become part of the golf course community and improve playing conditions for themselves and other golfers. The most commonly asked question: "How fast does that thing go?" I think they were a little disappointed when I said 3 miles-per-hour! Over the last month, we have really seen some ups and downs in moisture. After a wet June, we had a very dry week, then a little more rain. For a while, it seemed like the maintenance crew was pumping and reconstructing sand traps almost every day. See Update: May 15, 2010. I am happy to say we are back in what I call the "sweet spot" - not too wet and not overly dry. We have been having some beautiful golf weather. More pictures and articles to come . . .